NO PURCHASE OR PAYMENT NECESSARY TO ENTER OR WIN. PURCHASE DOES NOT INCREASE YOUR CHANCES OF WINNING. THIS QUILT-ALONG IS INTENDED FOR THE UNITED STATES. DO NOT ENTER IF YOU ARE NOT ELIGIBLE AND LOCATED IN THE UNITED STATES AT THE TIME OF ENTRY. VOID WHERE PROHIBITED. SUBJECT TO ALL APPLICABLE FEDERAL, STATE, AND LOCAL LAWS AND REGULATIONS. ELIGIBILITY: Open to legal residents of the 50 United States and the District of Columbia who are 18 years of age or older. The following individuals are not eligible to enter or win a prize: employees, contractors, directors, and officers of BERNINA of America, LLC. (“Sponsor”), its parent, subsidiaries and affiliated companies, and the web design, advertising, fulfillment, legal, judging, administrative, and Contest agencies involved in the administration, development, fulfillment, and execution of this Contest (collectively, “Contest Parties”), and the immediate family members (spouse, parent, child, sibling, grandparent, and spouse or “step” of each) and those living in the same household of each such person (those persons whether related or not who live in the same residence for at least three months during the twelve-month period preceding the start date of the Contest). SWEEPSTAKES PERIOD: The Quilt-along begins on September 10, 2018, at 8:30:00 a.m. Central Time (“CT”) and ends on March 10, 2018, at 11:59:00 p.m. CT (the “Quilt-along Period”). The Application server is the official clock for this Contest. TO ENTER: To participate, you must have a valid email address and Internet access. Participants must be registered to the WeAllSew blog. Enter online through the BERNINA blog: To enter, visit the BERNINA WeAllSew blog, located at www.weallsew.com (the “BERNINA WeAllSew blog”), during the Contest Period and click on the Community tab to upload an image and description of your Quilt and the process of creating it (the “Application”). 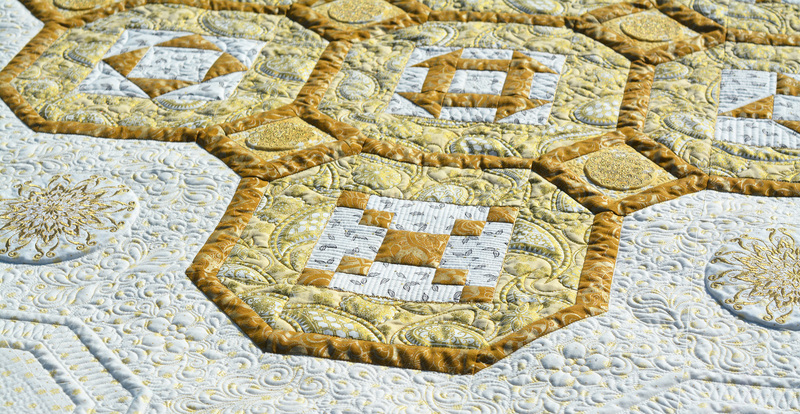 After you have accessed the Community section on the WeAllSew blog (https://weallsew.com/community/create/), select “BERNINA 125 Quilt-along” from the campaign drop-down menu. Participants are required to upload one image as a minimum and up to 12 images as a maximum showcasing their quilting progress including a short description. The images should be related to the quilt they create. Participants are required to share their process while quilting-along including the finished quilt. These official rules are available on the WeAllSew blog (www.weallsew.com). Information on how to enter the contest can be found in the blog post “BERNINA 125th Anniversay Quilt-along: Part I” on the WeAllSew blog. 8 (8) entries into the Contest per participant sharing the process while creating the quilt per quilt-along part including the finished quilt. For your entry to be valid, you must complete all required information. IMAGES: By uploading an image to the WeAllSew blog, each person represents and warrants that: The Image is original and does not violate or infringe the rights of third-parties; the Image is either his or her sole property or he or she has the right to display and copy the Image; and all persons appearing in the image have consented to the public display of the Image. The Image must not: display any brands or trademarks, other than those of BERNINA of America; contain material which is (or promote activities which are) sexually explicit, obscene, pornographic, or otherwise offensive, threatening, profane, or harassing, or otherwise unsuitable, as determined in BERNINA of America’s sole discretion. Images containing such content will not be considered and the person submitting such an Image will be disqualified from the Sweepstakes. DRAWING AND ODDS OF WINNING: Five winners will be awarded by a select BERNINA of America team from all entries received during the entire Contest Period to be conducted by Sponsor (“Administrator”) on or about March 20, 2019. Odds of winning depend on the number of eligible entries received during the Contest Period. Administrator’s decisions shall be final and binding on all matters relating to the winner’s selection. Use of color and value. Presentation of binding or borders. Consideration and execution of appliqué if used. Is the quilt quilted evenly so that it lies flat. Excellent incorporation, placement, and execution of embroidery. PRIZE RESTRICTIONS: Prize is non-transferable and no cash redemption or substitution is permitted, except at the sole discretion of the Sponsor. Sponsor reserves the right in its sole discretion to substitute a prize in whole or in part with one of comparable or greater value. WINNER NOTIFICATION AND PRIZE CLAIM: Winner is subject to verification, including verification of age, and will be contacted via a traceable method of mail sent to the address provided during registration. The winner will be required to verify their eligibility by completing, signing, and returning an Affidavit of Eligibility/Liability Release, and, where lawful, a Publicity Release (granting the use of the Winner’s name, city/state, likeness, or photograph by Sponsor for advertising/publicity purposes, without further compensation) within seven (7) calendar days of attempted mail notification or prize may be forfeited and an alternate Winner may be contacted. Prizes won by an eligible entrant who is a minor in his/her state of residence (18 years of age in AL or NE) will be awarded to minor’s parent or legal guardian who must sign and return all required documents. Sponsor is not responsible for any change of mailing address, email address, and/or telephone number of entrants. If a prize notification or prize is unclaimed or returned as undeliverable or if potential winner is found to be ineligible or not in compliance with these Official Rules, the prize will be forfeited and an alternate winner may be contacted and awarded the prize. Prize may not be awarded if the prize is not properly claimed. GENERAL CONDITIONS: INTERNET CAUTION: ANY ATTEMPT BY AN INDIVIDUAL TO DELIBERATELY DAMAGE ANY WEB SITE OR THE APPLICATION OR UNDERMINE THE LEGITIMATE OPERATION OF THIS CONTEST IS A VIOLATION OF CRIMINAL AND CIVIL LAWS, AND SHOULD SUCH AN ATTEMPT BE MADE, SPONSOR RESERVES THE RIGHT TO SEEK DAMAGES FROM ANY SUCH INDIVIDUAL TO THE FULLEST EXTENT PERMITTED BY LAW INCLUDING CRIMINAL PROSECUTION. If the Contest is not capable of running as planned for any reason, including without limitation, due to infection by computer virus, bugs, tampering, unauthorized intervention, fraud, technical failures, or any other causes which corrupt or affect the administration, security, fairness, integrity, or proper conduct of the Contest, Sponsor reserves the right, at its sole discretion, to disqualify any individual who is responsible or who tampers with the entry process, and to cancel, modify, or terminate the Contest. In the event of cancellation, Sponsor may award the prize in a drawing from among all eligible, non-suspect entries received prior to cancellation. In the event that an entry is confirmed to have been erroneously deleted, lost or destroyed, entrant’s sole remedy shall be another entry into the Contest. All determinations of suspect, erroneously deleted, lost or destroyed entries will be made by Sponsor and shall be final. LIMITATIONS OF LIABILITY AND RELEASE: No liability or responsibility is assumed by Sponsor or Contest Parties (collectively, “Releasees”) resulting from user’s participation in, attempt to participate in, or download of any information in connection with participating in, the Contest. No responsibility or liability is assumed by the Sponsor or Contest Parties for technical problems or technical malfunction, including, without limitation, those arising in connection with any of the following occurrences that may affect the operation of the Contest: hardware or software errors; faulty computer, telephone, cable, satellite, network, electronic, wireless, or Internet connectivity, or other online communication problems; errors or limitations of any Internet service providers, servers, hosts, or providers; garbled, jumbled, or faulty data transmissions; failure of any email transmissions to be sent or received; lost, late, delayed, or intercepted email transmissions; inaccessibility of the Application service in whole or in part for any reason; traffic congestion on the Internet or Application network; unauthorized human or non-human intervention in the operation of the Contest, including without limitation, unauthorized tampering, hacking, theft, virus, bug, worm; or destruction of any aspect of the Contest. Sponsor is not responsible for any typographical errors in the announcement of the prizes or these Official Rules, or any inaccurate or incorrect data contained on promotional materials or on the Application. Use of the Application is at user’s own risk. Releasees are not responsible for any personal injury or property damage or any other losses of any kind that may be sustained to user’s or any other person’s computer equipment/mobile phone resulting from participation in the Contest, use of the Application or the download of any information from the Application, or any other loss related to user’s participation in the Contest or receipt of any prize. As a condition of entering, entrants agree (and agree to confirm in writing): (a) to release Sponsor, Sweepstakes Parties from any and all liability, loss, or damage incurred with respect to entrant’s participation in the Contest and the awarding, receipt, possession, and/or use or misuse of any prize, including any travel related thereto; (b) under no circumstances will entrant be permitted to obtain awards for, and participant hereby waives all rights to claim punitive, incidental, consequential, or any other damages, other than for actual out of-pocket expenses; (c) all causes of action arising out of or connected with this Contest, or any prize awarded, shall be resolved individually, without resort to any form of class action; and (d) any and all claims, judgments, and award shall be limited to actual out-of-pocket costs incurred, excluding attorneys’ fees and court costs. WITHOUT LIMITING THE GENERALITY OF THE FOREGOING, SUCH PRIZES ARE PROVIDED “AS IS” WITHOUT WARRANTY OF ANY KIND, EITHER EXPRESS OR IMPLIED, AND THE CONTEST PARTIES HEREBY DISCLAIM ALL SUCH WARRANTIES, INCLUDING BUT NOT LIMITED TO, THE IMPLIED WARRANTIES OF MERCHANTABILITY, FITNESS FOR A PARTICULAR PURPOSE AND/OR NON-INFRINGEMENT. PUBLICITY: Except in Tennessee, and where prohibited by law, by accepting a prize, winner (or winner’s parent/legal guardian, if winner is a minor) grant permission for Sponsor and those acting under its authority to use their name, and address (city and state), photograph, voice and/or likeness, for advertising and/or publicity purposes, in any and all media (including posting on Application) now known or hereinafter invented without territorial or time limitations and without further notice to and without additional compensation. If you are selected as a winner, your information may also be included in a publicly-available winner’s list. GOVERNING LAW & JURISDICTION: All issues and questions concerning the construction, validity, interpretation and enforceability of these Official Rules, your rights and obligations, or the rights and obligations of the Sponsor and Contest Parties in connection with the Sweepstakes, shall be governed by, and construed in accordance with, the laws of State of Illinois, without giving effect to any choice of law or conflict of law rules. By entering this Contest, you consent to the jurisdiction and venue of the federal, state, and local courts located in DuPage County, Illinois for the resolution of all disputes, and agree that any and all disputes shall be resolved exclusively in those courts. Sponsor’s failure to enforce any term of these Official Rules shall not constitute a waiver of that or any other provision. If any provision of these Official Rules is held to be invalid or unenforceable, such provision shall be struck, and the remaining provisions shall be enforced. WINNERS LIST: The names of the winners will be posted on the BERNINA WeAllSew blog (www.weallsew.com) within 30 days of Contest completion, and will otherwise be available upon request by sending an e-mail request to marketing@berninausa.com, no later than April 30, 2019. SPONSOR: BERNINA of America, LLC., 3702 Prairie Lake Court, Aurora, IL 60504.